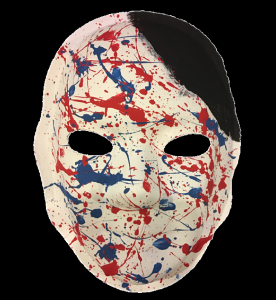 Explanation of Mask: The paint represents the “mess.” Black represents the injury to my head. It is a hole. Red represents blood and the blue sadness. Red is also pain. Now I am a photographer. My camera is my shield, it keeps me away from people. Having a TBI- art is a good way to express my feelings. Brain Injury: I sustained a brain injury in a car accident in 1999. 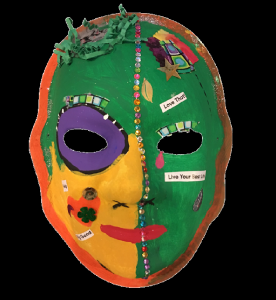 Explanation of Mask: My mask depicts the journey to accepting my new self after brain injury. The bottom is black, representing the darkness of my early years. I was in denial about my limitations. I couldn’t see what I couldn’t do. The words denial and lack of awareness are hidden in the black to represent that. As I became aware how much I’d changed, I grieved the loss of my old self. It didn’t seem like I’d ever be happy again. The gray-green of confusion gradually lightened to the yellow of acceptance. I found new avenues of meaning and purpose. I am living with a disability, but I will always reach for the stars. 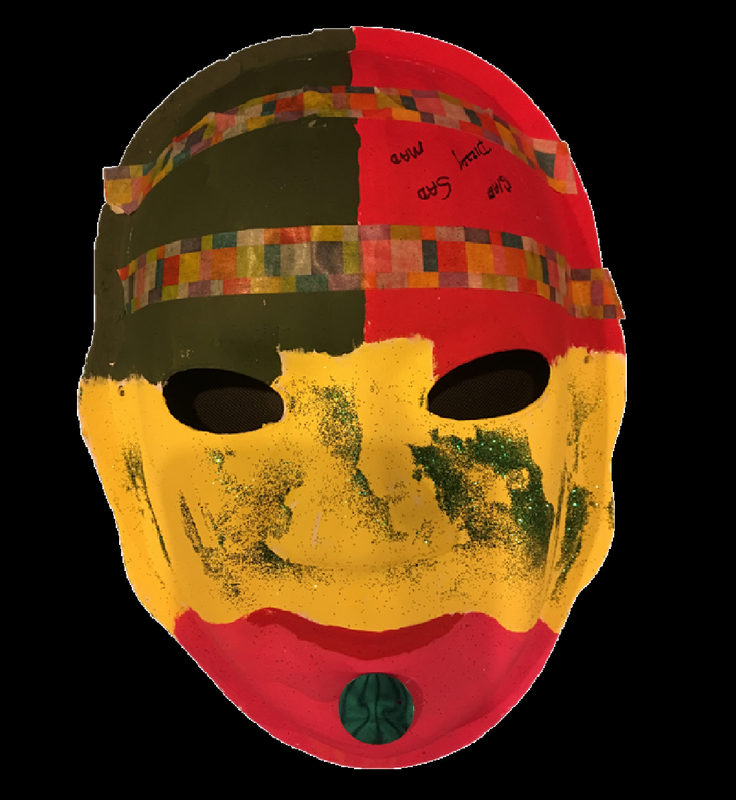 Explanation of Mask: When I was growing up, I had difficulties in school. I couldn’t see like other kids, I saw things upside down and backwards. I was lucky, since I had so many surgeries they never asked me to go up to the blackboard, so no one found out until junior year in high school. The squares represent my book keeping teacher who helped me and gave me extra classes. The sparkles are my tears because of how I used to be sad I wasn’t like other kids. The spot is my hesitation; I have a hard time walking and hesitate often. The green is the blackboard, the red is the part of my brain that is upside down. 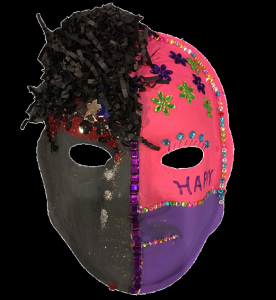 The yellow on my mask is my positive side, and the pink is me looking forward and keeping my chin up. Brain Injury: Closed head injury and post concussive syndrome due to a propelled accident off of my horse in 2006. Explanation of Mask: My mask portrays the dark grey, black and blue matter that occurred with accident. The brain injury created dark shades of my life being lost. I lost my job, my horse, horseback riding would be no more. I lost the ability to play my flute and the friends that went along with those activities in my previous life. I lost my peripheral vision making driving limited to daytime within 10 miles of my house on a good day. The red tear is for gratefulness, the green drops are the hopes I create. My mouth is closed because I often feel underheard especially by medical and disability systems. Out of this injury I have learned to create art and write about the experiences of loss and how hope lives within these happenings. 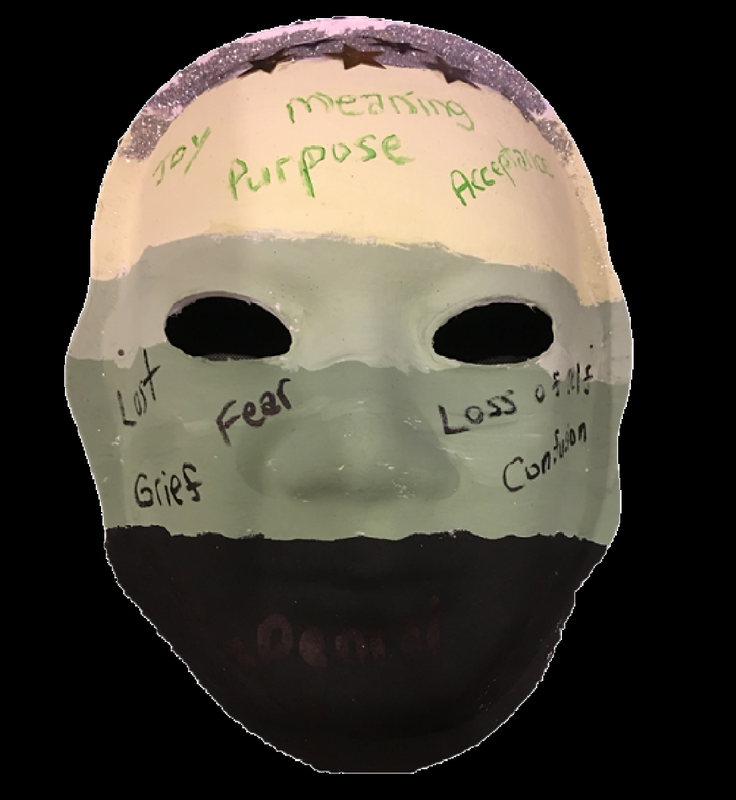 My book, “Reinventing Oneself After Loss, An Artful Insight”, are represented with the orange spots of coming back to life with purpose and hope. Explanation of Mask: My stroke left me with brain injury, aphasia, and balance issues. Everything I used to know, reading, writing, and talking – I had to relearn. I had to go one step at a time. It took a long time to get back to my creative projects like reading. It took me 5 years to be able to sign a check and aphasia still raises its head sometimes. This was a 7 year journey, a strong faith and a lot of tools helped me to walk out from the darkness and shine. My mask is like a patchwork quilt, it includes textures, patterns, shapes and colors. This is my new life, and I am a new person. Acceptance was hard, while denial was easier. Brain Injury: Fall 2010- Hit head on concrete floor. Explanation of Mask: My mask represents a journey that started dark and confused. At times I felt wasn’t present. A lot of people said I looked just fine but inside my head was scrambled eggs. 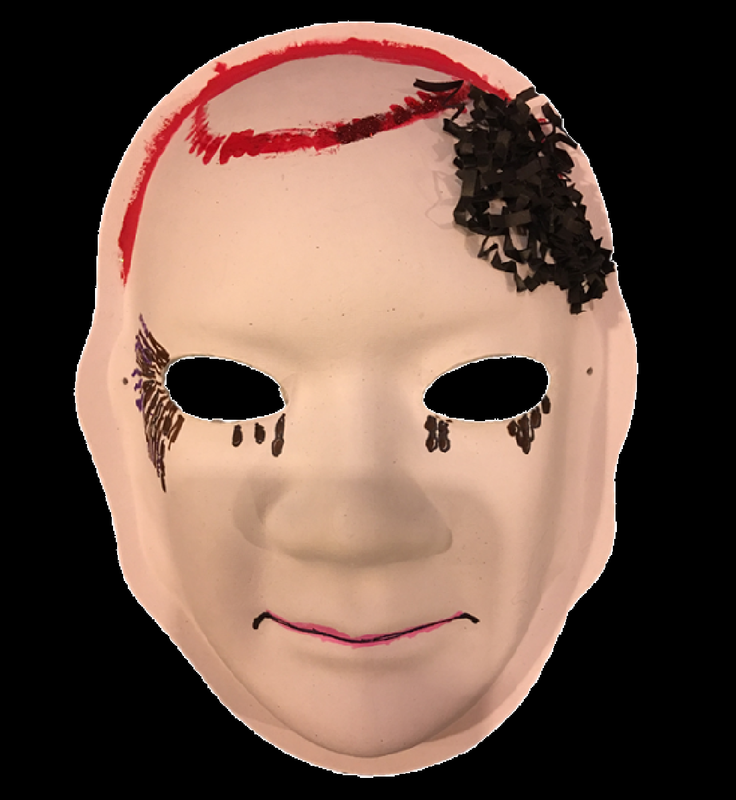 The glitter on the left side represents the feeling of the injury, there was a blood sac but there was no bleeding. Through rest and therapy over the years, I started to see the light and let happiness in. My journey continues, even though I still have past symptoms, happiness outshines sadness. The flowers and jewels are about how I do a lot of outdoor gardening, and I have a lot of grandchildren who are jewels in my life. The pink and purple are my granddaughters favorite colors, and I like purple as well. 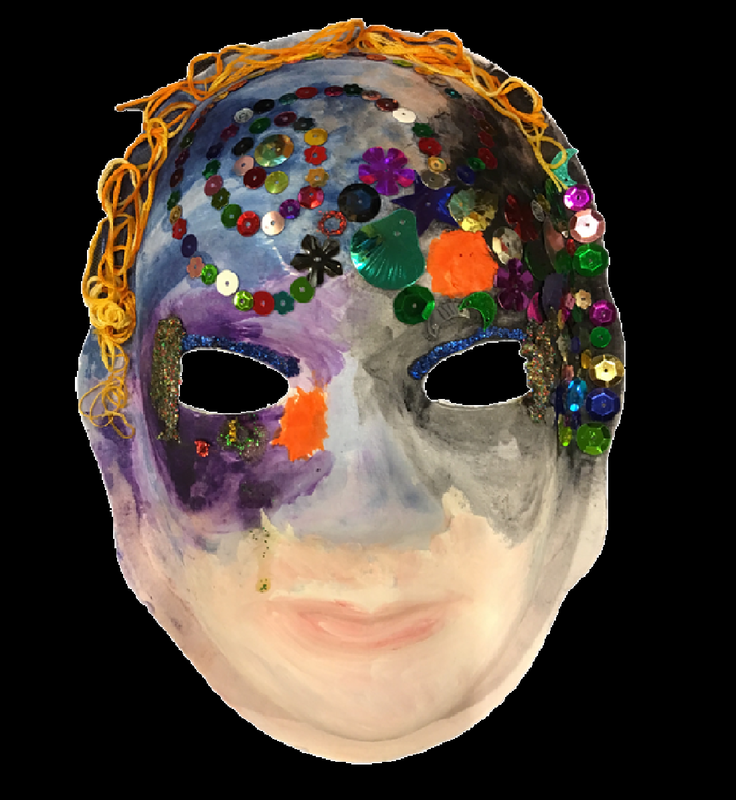 Explanation of Mask: My mask represents the challenges that I still face; I often describe my brain as a snow globe; I know that the parts and pieces are there but I have to wait for the snow to settle to find them. When I become fatigued, the sensations of numbness and tingling return to my left side. Sometimes I have to remind myself to stay calm and that some of the changes are for the best. For the most part I am upbeat and have found new ways to do the tings that mean the most to me. 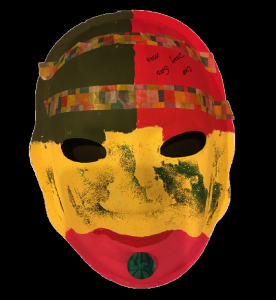 Explanation of Mask: I lost my peripheral vision. They had to drill into my skull and a plate in my skull. My head is all fuzzy often times. I tend to be weepy. I have a smile but I hick it the black because it is not a true smile. I hide my smile because I feel overwhelmed and not always able to give it back, “Always taking”. At least I am able to get around by myself. I can walk and put thoughts together. I can care for myself. 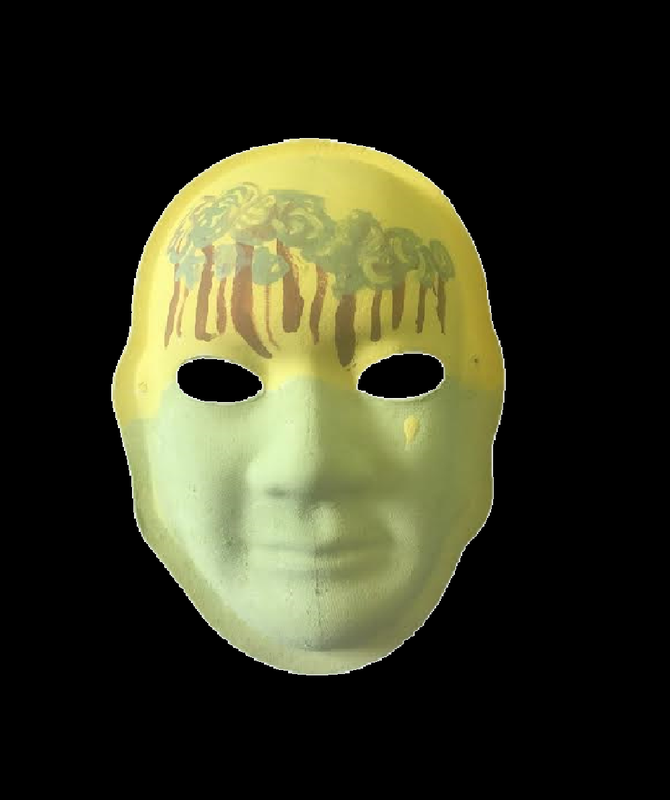 Explanation of Mask: My mask is mostly green because it is my favorite color and because I like to garden. The grey area at the top right is my brain injury. The green stuff around the grey area represents my fuzzy thinking. The glitter around my brain injury is the “Blessing in disguise.” The line down the middle represents my midline shift and my left side neglect. I chose gems because that is why I have my service dog, Zeva. Her name means brilliance and gems. The X’s on my nose is because I lost my sense of self. The orange heart represents his loving care that surrounds me. The things on the heart, like the shamrock, represents my luck in having Ross, my husband. He is the sun and moon to me. The pink tear is my loss. Purple around my right eye is a lens because I have a whole new view on my life. 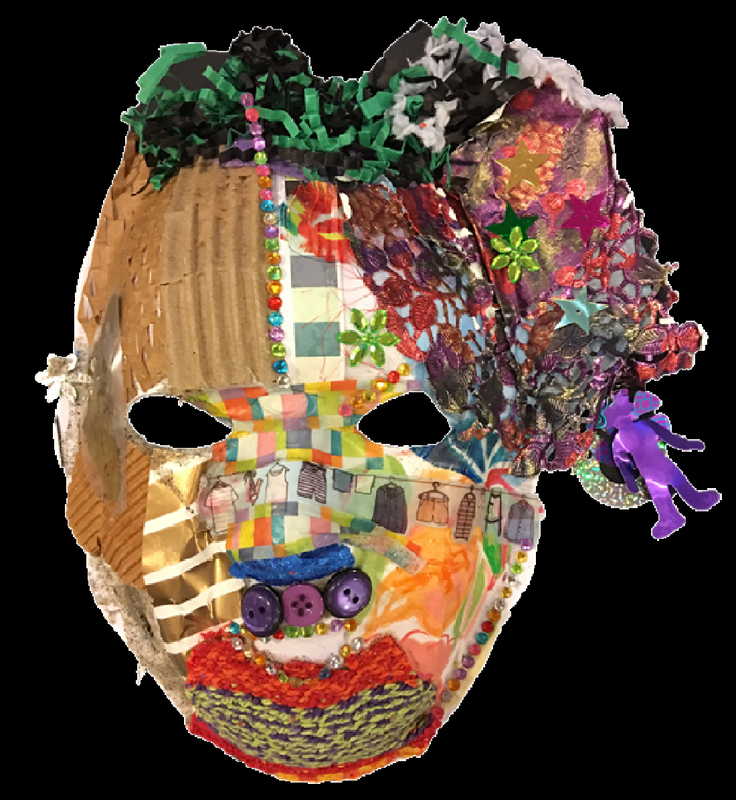 The fabric on the mask reflects my love in quilting. Brain Injury: I had a stroke in 2012. 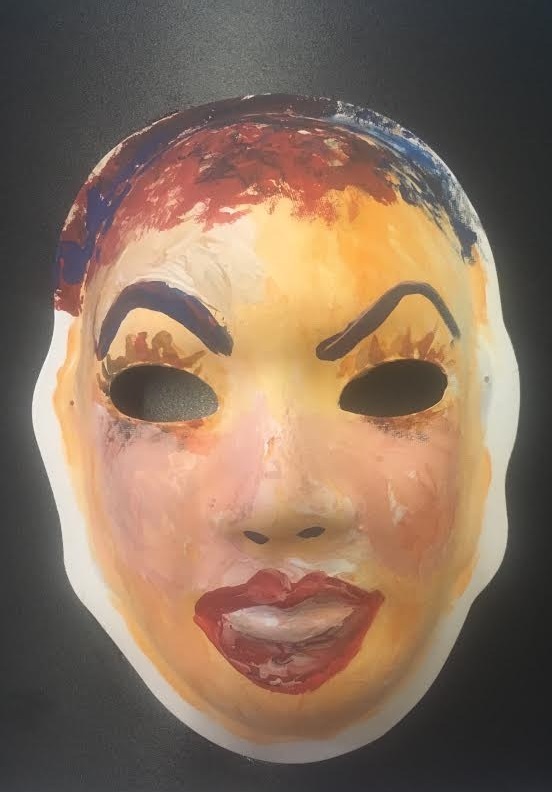 Explanation of Mask: The right side of the mask is during the stroke. When I was having the stroke, I felt like I was underwater and couldn’t see. That’s why the eye is covered. And I couldn’t speak. 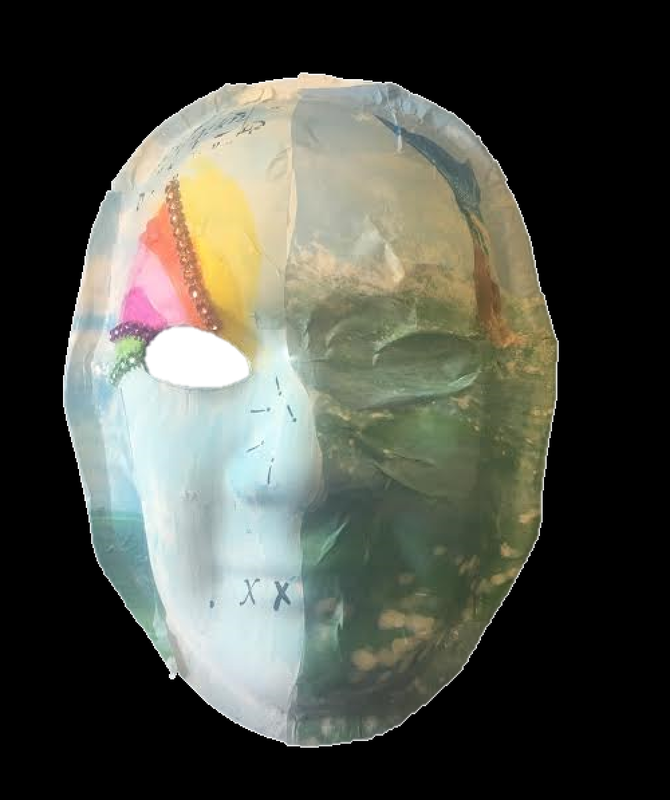 The left side of the mask is how I felt after the stroke, floating in space, with a cloudy mind. I had trouble speaking and my nose was tingly. I tried to figure out complex things in my brain, like reading and music, to get my mind back to where it used to be. I went at it like a bulldog. I had to keep at it. I wasn’t willing to let it slide. Colors became much brighter and intense. Everything was vibrant. That was a good thing from the stroke. Brain Injury: I had a stroke caused by a carotid insufficiency in 2016. 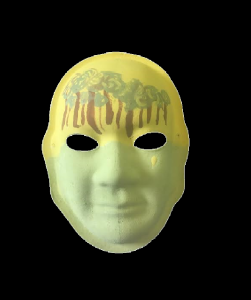 Explanation of Mask: I picture what’s happened from the stroke as a series of trees, a forest that I am trying to get through. Some are small and easy to get around, some are middle-sized, and some are too big at this point for me to get around. The yellow is light and joy. The tear is for both joy and sorrow. Brain Injury: A stroke in 2002 took out my right arm and leg and left me with severe aphasia. Explanation of Mask: For 1 year I was silent and couldn’t talk. I was lonely and blank. The sad side shows grey, with a lightening bolt (yellow gold) from the sky. I cried a lot and wondered why it happened to me. The yellow side is bright, sunny and warm. Speech- I am learning to talk in sentences now. My family is love and I am close to my husband and two sons and my Mom and Dad and others. I felt love from my teacher friends and colleagues. They brought dinners and food. Music- I couldn’t sing or play music for 13 years. Now I am singing and composing music and playing the piano for 2 years. Art is hard but I can create flowers and the sun. Our art group is like family. Brain Injury: Concussion with two previously untreated concussions. Explanation of Mask: My mask represents the changes since my injury. One of my biggest challenges is my difficulty articulating what I am thinking and feeling. I was always a very social person, and now I am very isolated because of my noise sensitivity, tinnitus, light sensitivity and brain fatigue. I feel trapped. My brain feels like a whirling ocean. I am grieving the loss of me before my injury — 5 months ago. I am trying to accept myself now hour by hour. Brain Injury: In 2010, a huge old school intercom system fell off the wall onto my head causing a traumatic brain injury. 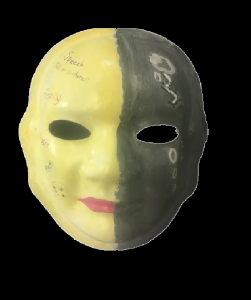 Explanation of Mask: The yellow represents a cheery facade that hides my overwhelmingly painful symptoms of my TBI. The lines on part of my mouth represent, only sometimes, I have no filter. The tree and flowers represent nature which I feel most connected with when I am outdoors. 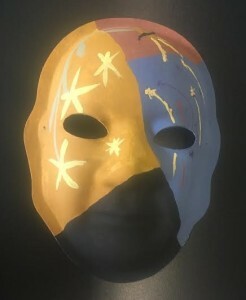 The stars represent a positive energy. The Bible scripture states that without faith and God I wouldn’t be here. The names Noah and Jacob are my boys. I am grateful for their compassion, support and sense of humor along on my journey. It changed all of our lives as I am a single mom. 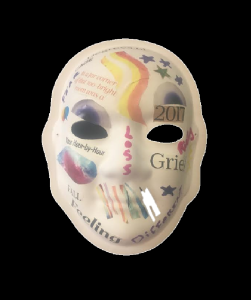 The tear and words represent symptoms that can be very challenging. The words on top of my head represent positive focus. 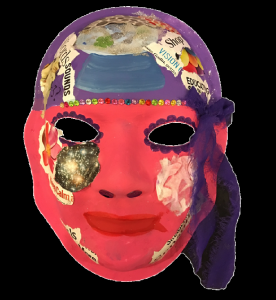 Being creative has played a big part of continuing to heal and getting to know who I am now. Brain Injury: I had my stroke in 2004. I lost the dominant arm and leg and my speech. Explanation of Mask: I was an illustrator, administrator and educator. I was mad I felt like I lost everything suddenly…twice when I had my strokes. The brownishtan represents the stroke itself. My mouth shows I like to talk but it is hard. What I can do now is art and jewelry making. I love the art. My kids helped me get through the hard times. My painting groups and friends I paint with are important to me. 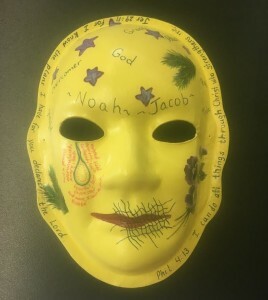 Explanation of Mask: After the fall, there was darkness. Later I would have thoughts that would be like 4 thof July fireworks exploding in my head with bright lights and vibrant colors. After a few seconds, the lights and colors would fade back into the darkness from which they came. Then at some point a thought didn’t vanish, it lingered like a newly planted seed began to grow. A new life had begun. One good thing about my brain injury is that I found LOVE and the I COULD BE LOVED.